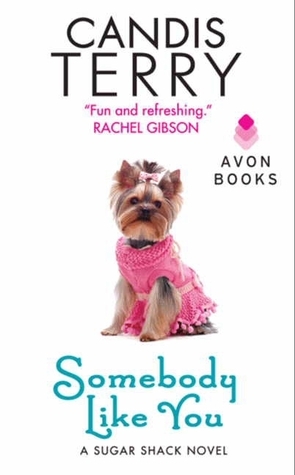 Somebody Like You (Sugar Shack #3) by Candis Terry. Publication : June 19th, 2012 by Harper Collins. Heaven only knows what Kelly's dearly departed mom has planned from the other side—especially since she's already meddled in Kelly's siblings' love lives. But even heaven knows that when love comes. After reading the blurb of Somebody Like You, I knew immediately that this was my kind of book because after all, who doesn't like romance (except for guys - they don't count)? This is the first book I've read that's by Candis Terry and it was pretty much what I expected. Kelly Silverthorne has a record of success. She has never lost a case, at least, not until the one in the beginning of this story. Due to lack of evidence (the body), Kelly loses one of the most important cases ever because of which a guilty man goes unpunished. Unable to face her failure and utterly embarrassed, Kelly flees to her hometown in Montana to get away for a while and that's when she runs into her former one night stand, Deputy James Harley. James Harley has always had feelings for Kelly. However, Kelly's been completely oblivious to this and never saw him as anything more than a man she once slept with. I read this book in 3 hours. I was hoping for a quick, light, sappy and cliche romance novel and Somebody Like You was exactly that. This book falls perfectly into the romance category; actually, it's one of the good ones in the genre. Kelly and James make an adorable pair and the chemistry between them is (as expected) hot. Although predictable, Somebody Like You is everything that it should be - short, sweet and cheesy which makes it the perfect beach read. This is the kind of book that sates a girl's need for romance and happy endings. Although this isn't a book I'd go looking for at the bookstore, if I do come across it by chance, I'd definitely pick it up - this and all the other books in the Sugar Shack series. I enjoyed this too! But I honestly I wish there was more foreplay ROFL but I liked that James wasn't all macho, his vulnerabilities were highlighted and it wasn't all about Kelly.